Feel the presence of Bethlehem, where Jesus Christ was born, back to your home with the unique Christmas gifts available in a wide and complete assortment available at our website. The range includes Christmas ornaments, nativities, jewelry, necklaces, crosses for women and men, crucifixes, rosaries, pendants, and statues. Interestingly, our selection speaks for itself and marks all promising occasions in a religious manner. 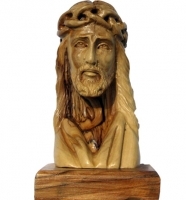 At HolyLand-Gifts.com, you get fine quality and impeccable gifts in different styles, finishes, designs and sizes suiting your specific religious needs so that you can use them as gifts on the occasion of Christmas or throughout the year. With our wide and exhaustive variety of unique Christmas gift, you can add more color and love to the existence and relevance of the Christmas season. With us, you can have all sorts of gifts of your choice at reasonable prices that suits everyone. Don’t wait any longer. Grab a unique religious Christmas gift and offer it to some you love and respect.